A series of 21 podcasts from the 2018 Annual International Conference in Philadelphia, Pennsylvania are available for you to listen to and view. These podcasts share through in-depth interviews interesting perspectives about the industry, the meeting, the Society, the profession and more! 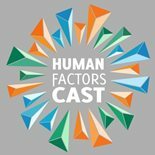 Check out the recordings here and be on the watch for podcasters and Human Factors Practitioners Nicholas Roome and Blake Arnsdorff at future HFES meetings. Listen here and share this link in your social media posts. Enjoy!